Cardboard coffins are one environmentally friendly coffin choice. Some cardboard coffins are plain and a good base for painting or decorating. Sorry, we do not sell cardboard coffins for delivery. We only use them if you are making funeral arrangements with us in the Manchester /Cheshire / South Lancashire. 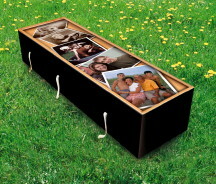 Family and friends can paint, stick photos on, stick bits of their loved one’s own artwork on the coffin or pictures produced by the family’s children. Some families that we’ve worked with have put colourful handprints all over the coffin; from the lady’s 3 month old grandson to her widower, I think there might have been a set of cat’s paw prints too. Other families have chosen to write messages on the coffin as part of the ceremony. Some cardboard coffins are pre-decorated. Shown are coffins with a poppy design and an ivy design. These coffins are becoming popular and we’ve even seen them on television recently with Hayley Cropper from Coronation Street having a floral cardboard coffin in January 2014. The image shown below is of architectural pencil drawings covering a coffin. George Melly (musician, film critic and art lecturer) had a cardboard coffin covered in photos and drawings. And surprisingly the romantic author Barbara Cartland had a cardboard coffin (though it wasn’t pink). Cardboard coffins are welcomed for use in natural or woodland burial grounds because they are biodegradable and from sustainable resources. All our eco-coffins are suitable for traditional, green burial or green cremation. They are accepted at Manchester Crematorium, Oldham Crematorium, Stockport Crematorium, Eccles Crematorium (Peel Green), Salford Crematorium (Agecroft), Walton Lea Crematorium (Warrington), Dukinfield Crematorium (Tameside), Blakely Crematorium and Altrincham Crematorium. Some crematoriums may request that the coffin is put on a wooden base so that it is easier to load into the cremator. Please note that our cardboard coffins are only available in smaller sizes. Other environmentally friendly coffins available are crafted from; bamboo, banana leaf, cardboard, willow/wicker, pandanus, seagrass, and wool.